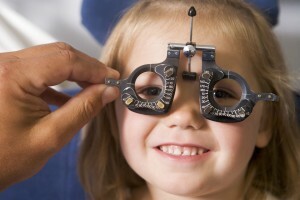 At Georgetown Vision Center Dr. Birkmann performs exams on children of all ages. It is recommended by the American Optometric Association that an exam be performed within the first year, and again around 5, or before kindergarten. Since children’s eyes and visual systems are changing so quickly at this age, an exam every 1-2 years during school years is recommended, even if there are no signs of a vision problem. Remember, children are not very good at telling us when there is an issue. Early detection is the key to maintaining healthy eyes and vision. Only 10% of children ages 9-15 who need glasses actually have them!! 1 in 10 children are at risk from undiagnosed vision problems. School screenings are not comprehensive exams, and do not replace the need for yearly eye examinations by an optometrist. 1 in 4 children struggle with reading and learning because of undiagnosed vision problems. According to the American Optometric Association, 60% of problem learners in school have undiagnosed vision problems contributing to their difficulties with learning. It is important for parents and educators to know the signs and symptoms of vision problems that interfere with academic performance. Below is a list that can help identify vision problems in children. One eye drifts or aims in a different direction than the other (can be very subtle). If your child is experiencing any of these symptoms, or has not been seen for a comprehensive examination recently, call our office at 512-869-8821 to schedule an eye exam. Remember, school screenings are NOT comprehensive examinations and do not replace the need for an exam.